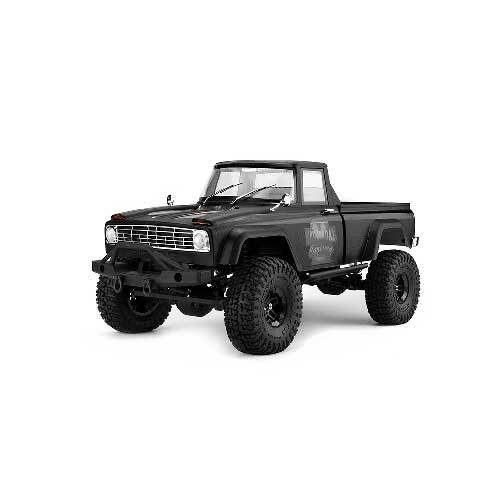 The RTR Coyote has all the features you would expect of a rig of this type. It’s designed around a steel ‘C’ section ladder chassis, has a detailed 50s style truck body, and is designed to be the starting point for anyone wanting to get into this exciting a vibrant sector of RC at an affordable price. It’s not a competition rig; it doesn’t have any fancy gimmicks or technology, but it is a robust, well-designed and tested one-box solution. Just charge the pack and hit the trails. It really is as simple as that. But looks can be deceiving: Underneath the understated shell is a full steel UJ equipped driveline with a locked-axle transmission to generate maximum traction from the slipper clutch protected gearbox, right through to the wheels and tyres. A 35T brushed motor offers the perfect balance between torque and RPM, and true 4-link double triangulated link geometry is used to minimise axle steer. 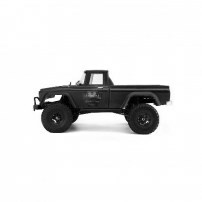 The high torque, axle mounted servo can be chassis mounted in the future if so desired, and the waterproof electronic speed control is programmable for both NiMH and LiPo use, with a crawler mode set as its default which offers instant reverse and always-on drag brakes. 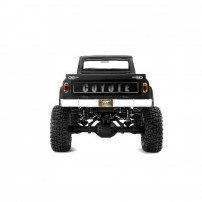 The high grip 1.9” offroad tyres are fitted to real beadlock wheels allowing the owner to fine tune the rig’s weight bias for crawling by adding stick on wheel weights. For fun and trail-only use, the rig’s stock setup is just perfect. The front bumper is winch-ready and the shell designed to accommodate an LED kit to add that extra touch of scale realism and allow night runs. Scale, Trail, Crawl. 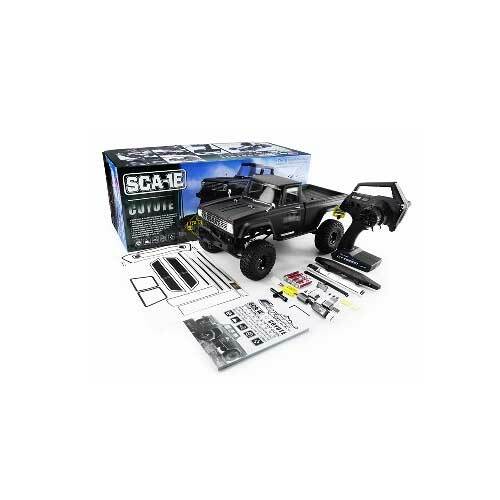 The SCA-1E is capable of all, and the basis of as detailed or as simple a scale build as you want to undertake.